Since 1960, none of the 64 expansion teams to launch in the NHL, NFL, NBA or Major League Baseball managed so much as a winning season. Then, the Knights came along winning the Pacific Division, posting a .655 winning percentage, and sweeping their first-round playoff series with the Los Angeles Kings... but their toughest battle may be off the ice. 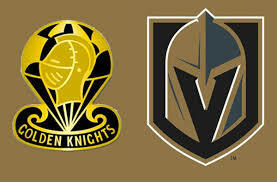 Troubles with the Golden Knights name began less than a month after the hockey franchise announced that choice in November 2016. At that time, a Vegas trademark request was denied over the “likelihood of confusion” with the registered mark of the Golden Knights of the College of St. Rose in Albany, N.Y. In August 2017, the United States Patent and Trademark Office approved the team’s use of its name for identification and competition purposes, but it suspended a trademark request for the Las Vegas logo pending further appeal. On Jan. 10, that appeal came. The U.S. Army filed a complaint with the trademark office over the Golden Knights ownership’s use of a name and color scheme similar to that of its athletic teams and Golden Knights parachute team. Two weeks later, Las Vegas filed a settlement motion with the Trademark Trial and Appeal Board. As of yet, there has been no resolution. The team’s majority owner, Bill Foley, is a West Point graduate. He took an active role in choosing the color scheme, mirroring that of West Point’s Black Knights. His ownership group is named Black Knight Sports & Entertainment, LLC. Sports Illustrated legal analyst Michael McCann, an attorney and associate dean at the University of New Hampshire School of Law, reported that a panel of three Appeal Board judges will evaluate the official arguments and offer a written decision — a process that could take more than a year. He further posited that if the Army’s argument succeeds, its next step could be to seek an injunction barring the team from using its name. The losing side could appeal, and the case could take years to meander its way to a conclusion. More likely, though, would be a settlement. For example, the Vegas Golden Knights could change their colors. Or maybe the team’s name could be tweaked. So, bring on the Vegas Knights. Days don’t matter there, anyway.